One of the highlights of the Coach Tourism and Transport Council’s Coach & Bus Show this year was the Driver of the Year competition which culminated in Niall Cronin Jnr of Cronin’s of Cork finishing in first place. The tenth biennial Coach and Bus Show took place in the RDS Simmonscourt Pavilion on the 17th and 18th of November. The show, which was officially opened by Minister Brendan Griffin, was a complete sell out with in excess of eighty Exhibitors featuring large and small industry suppliers showcasing their unique range of products and services. The Driver of the Year competition provides drivers with the opportunity to demonstrate their unique driving skills and knowledge of the industry. Niall beat off stiff competition from Liam Doherty of Barrett Coaches and his Cronin’s colleague, Ronan Kearney, who took the bronze medal. The calibre of driver at Cronin’s disposal was very much in evidence as a third member of their workforce, David Ryan, was ranked sixth overall. 34-year-old Niall has been driving for the past 12 years and is maintaining a proud family tradition that spans three generations. The entrants in the Driver of the Year competition faced a stern examination of their bus driving credentials before Niall was declared the winner. “The competition consisted of three areas: a theory test based on your knowledge of the industry and a 15 to 20 minute interview where you had to expand on that knowledge and outline the challenges that faces drivers along with the pros and cons of being a driver,” he explained. “Ultimately, you had to show a good knowledge of industry regulation and a good understanding of the various requirements across the industry. Cronin’s Coaches celebrated their 60th Anniversary in 2017 and the provision of top quality vehicles and service is at the core of their success. The well-known Cork operation was awarded Coach Operator of the Year 2016 and Niall and the next generation of the Cronin family is working hard with a staff of 95 people to build on their reputation as one of the top Coach companies in Ireland. 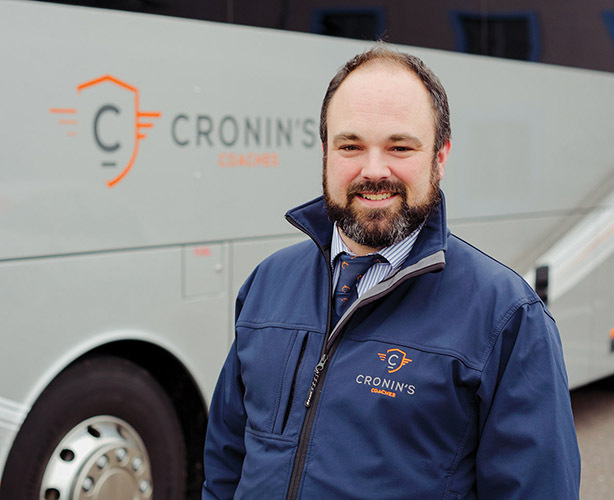 With a growing fleet of 75 vehicles Cronin’s can cater for all types of business, from touring the four corners of Ireland, to providing for their corporate clients and also working with local sports teams, schools and general private hire. The company’s head office and depot is based in Cork City 10 minutes from Cork City Centre and Blarney Wollen Mills. Second to that is their Dublin based operation 10 minutes from Dublin airport. Both depots have the capacity to handle any type of private hire be it Touring Related, Corporate, Incentive, Private Hire or Schools. So what are the pros of driving that Niall discussed in detail during the Driver of the Year competition? And the cons? “It’s has gotten very tough nowadays for drivers to manage their hours. A lot of drivers would like to work all the time but you just can’t do that and that makes it hard to make a living. The increase in the volume of traffic on the roads also makes it a very difficult job and lack of facilities and parking also adds to the hardship. The Coach & Bus Show was a weekend to remember in more ways than one for the Cronin family. “Dermot Cronin Motors launched the new VanHool EX Range,” Niall revealed. “We had 19 coaches on order and sold eight of them over the weekend. My grandfather Dermot and father Niall were present on the weekend, as was my uncle, current MD Derry Cronin. It was great to bring the trophy home to Leeside,” he concluded.